David Kennerly says this 1968 photo of his, taken in Los Angeles at the beginning of Robert F. Kennedy's presidential campaign, captures what it meant to cover the chaotic and carefree period as a photojournalist. "Everybody could get close, everybody wanted to," he says. (Top) Ethel Kennedy in the back of an ambulance that took her husband, Robert, to the hospital after he was shot at the Ambassador Hotel. (Left) Kennedy's bodyguard Bill Barry at the hospital. (Right) Former first lady Jacqueline Kennedy at Los Angeles International Airport going to visit her brother-in-law after he was shot. Kennedy died the next day from his injuries. 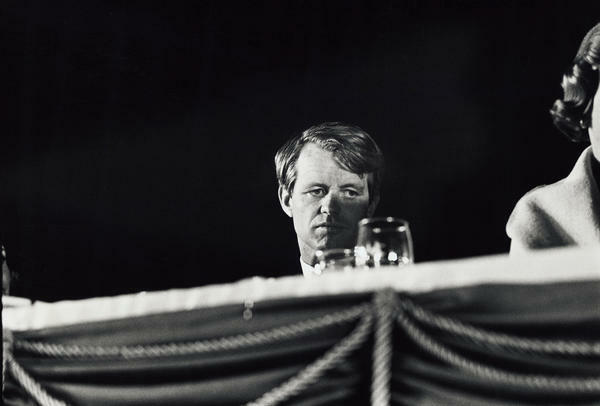 Presidential candidate Kennedy during a campaign event at the Biltmore Hotel in Phoenix in 1968. 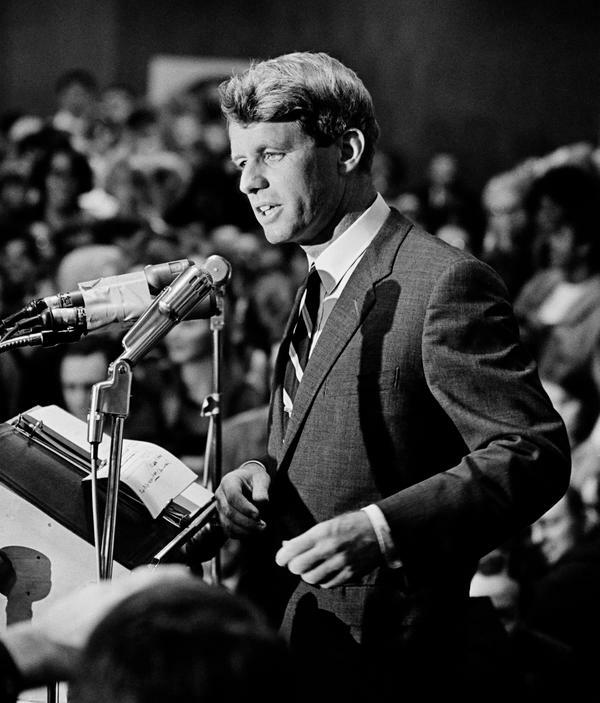 Kennedy gives a speech at an Oregon labor hall, where he campaigned on behalf of congressional candidates, in 1966. This was young photographer David Kennerly's first major political photo, at the beginning of his long career covering many of the important events of his generation. 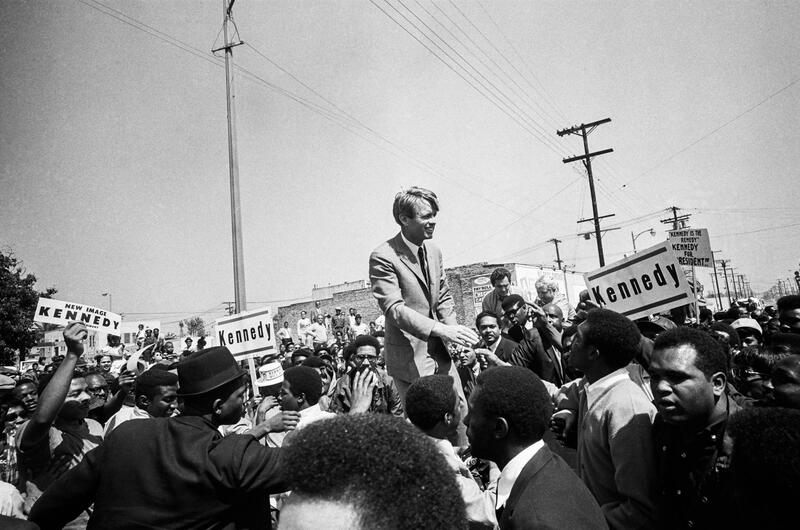 Kennedy campaigns in the Watts section of Los Angeles in 1968. It's unlikely that David Kennerly's most famous photographs could be recaptured today. That's because 50 years ago, the Pulitzer Prize-winning photojournalist and his colleagues covered the Robert F. Kennedy campaign under far more relaxed circumstances. In 1968, New York Sen. Kennedy entered the race late after the New Hampshire primary, and, less than three months later, was assassinated in June, at the age of 42. "Even seeing the pilot coming out of the window — everything about that photo is so period," Kennerly says. "It gives you an idea of sort of the constant melee that was a Robert Kennedy campaign back then. Everybody could get close; everybody wanted to." This was just 4 1/2 years after the assassination of his brother President John F. Kennedy, who at the time had been riding in an open-top limousine in Dallas. More recently, the Rev. Martin Luther King Jr. had been assassinated during the Bobby Kennedy campaign in April. Still, Kennerly says the lack of ample security detail around presidential candidates didn't make him nervous. "We still hadn't gotten to that point despite the fact that JFK was shot — where security had just taken over everything." "[The distance created by security] cuts back on the fun, free-for-all kind of aspect of a campaign." Though not as common, Kennerly says photographers can still catch glimpses of Washington's underbelly today. "In these campaigns, even now — like in New Hampshire before people get traction, and get close to a nomination — you can still have these kinds of moments, believe it or not," he says. United Press International had assigned Kennerly to cover the campaign from Los Angeles, where he had been working at the time. 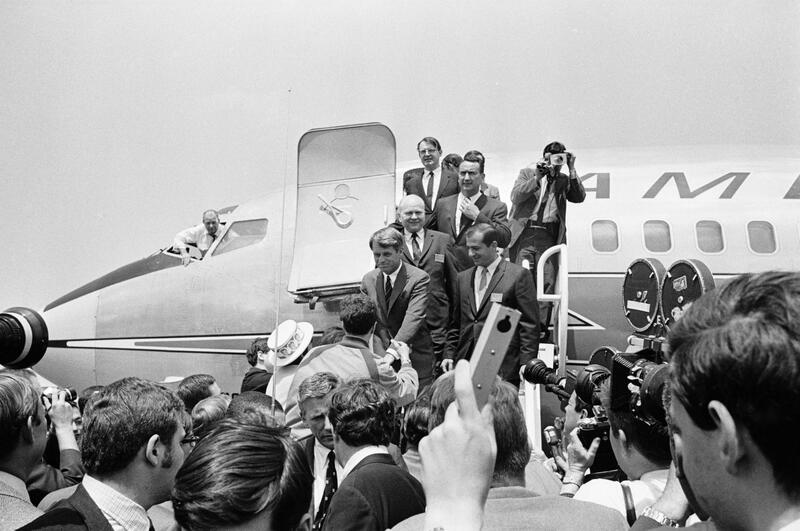 After covering Kennedy's campaign stop in New Mexico, Kennerly says, he was supposed to board the senator's Arizona-bound plane. But as a 21-year-old journalist, Kennerly was turned away at first. "They weren't going to let me on the plane because I looked like ... I wasn't old enough to buy a drink," he says. "Finally, I made so much noise that they figured I must be a real, live journalist." So he hopped aboard and, some moments later, Kennedy introduced himself, asking Kennerly, "How you doin'?" " 'Well, I'm not doing too well; your guys weren't gonna let me on the plane.' And so, there started my career as a malcontent in the business." Kennerly figures Kennedy "must've said something to his staffers, 'cause at the next stop I got incredible help from the staff — 'Hey, wherever you wanna go, get right up there.' "
Kennerly's most memorable moments on the campaign trail are when he got face time with Bobby Kennedy. "I really remember being able to talk to him, and you know I've always been kind of — I wouldn't say crusty news photographer, although that's how I was brought up in the business — but I was always slightly awestruck by him, mainly because of the way he related to people." He'll never forget the minutes leading up to Kennedy's assassination, when he had been upstairs in RFK's room at Los Angeles' Ambassador Hotel. "Well, again, you could come and go. I was an accredited member of the press, and they knew who I was and all that, but to be able to just wander up." The two had a rather mundane conversation, Kennerly says. "But he said it was good to see me again and glad I was there, and that was about it. But it just struck me because about 20 minutes later he'd been shot." But down in the ballroom, where the candidate gave his final speech, Kennerly would take one of the last pictures of Kennedy alive, flashing the victory sign and a toothy smile. He and his UPI colleague Ron Bennett "flipped a coin to see who would take the podium and then follow him down to an overflow ballroom after the initial speech," he says. "I got the riser; he was on the podium, went with Kennedy back through the kitchen where [Sirhan Sirhan] was waiting and shot him. "Ron Bennett has an incredible set of photographs — Robert Kennedy laying on the floor with rosary beads, Sirhan being caught." "This was a wild, crazy time; I was not in the room. It was so shocking to me. I mean, I'd never been around anything like that where somebody I knew had been injured, much less killed. But I still did my job and I look back at that night, just kind of on autopilot." 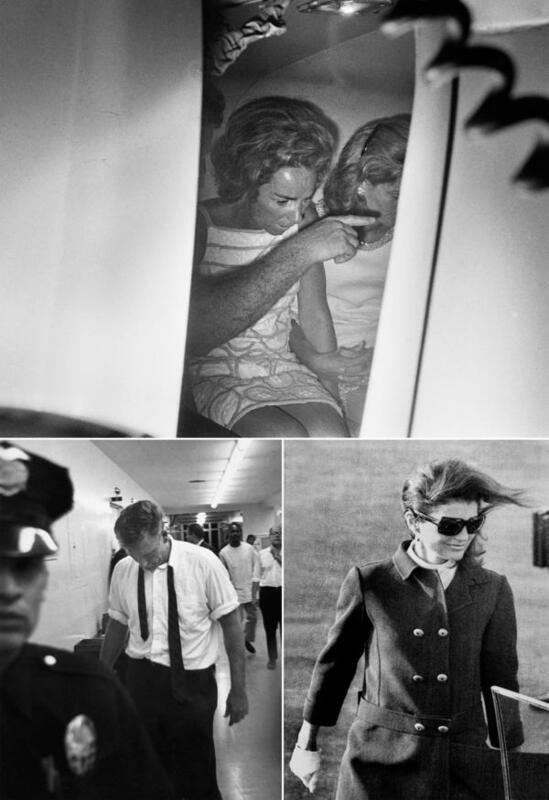 Even after that night, Kennerly says the threat to politicians, and the now rare access had by their photographers, appeared unchanged for the next several years. "During the Gerald Ford time, [security presence] was half or a quarter of what it was now," he says. In 1975, Kennerly was the official presidential photographer the day Lynette "Squeaky" Fromme pulled a gun on Gerald Ford, and then when Sara Jane Moore shot at Ford within the same month. Exiting San Francisco's St. Francis Hotel, he says, "Sara Jane Moore got off a round at him and came closer to hitting me and the Secret Service agent than it did him. But it still showed the danger of the presidency." Even with Secret Service protection, he says, both events "showed that things hadn't changed that much." "Now you'll never see an opportunity like that come up for a would-be assassin." The bolstered security around the presidency has drastically altered the political photographer's access, Kennerly says. "Now, they're in the bubble 100 percent," he says. "I mean rightfully so, but it's really taken the fun out of politics for me. "You're ushered in and ushered out," Kennerly says. "I feel like a photo robot sometimes."